posted on Facebook by me tonight. Took these tonight just as and after the sun went down. My 13 yr old musical grandson has his own band and they have been playing in community settings with huge groups of people. They are getting themselves out there. They played a couple weeks ago at a yearly event (2nd time) and the band had 45 minutes to share their cover songs and one my grandson wrote. Tonight he and hid dad were putting up lights for the event next week. 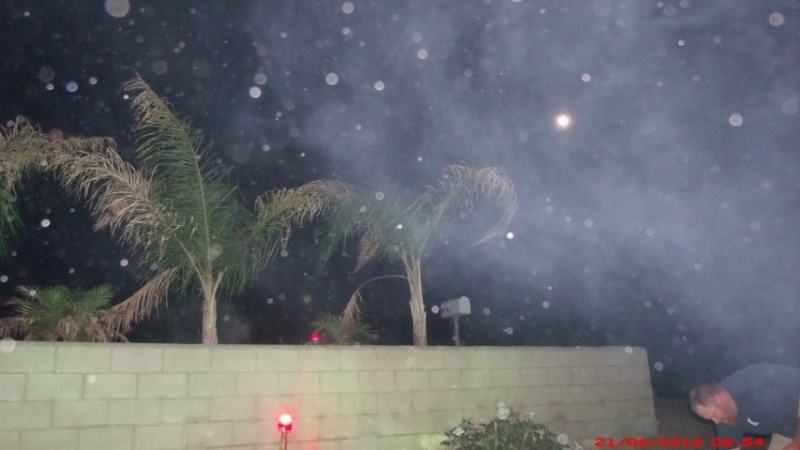 I happened to have my camera and WOW a ton of orbs. 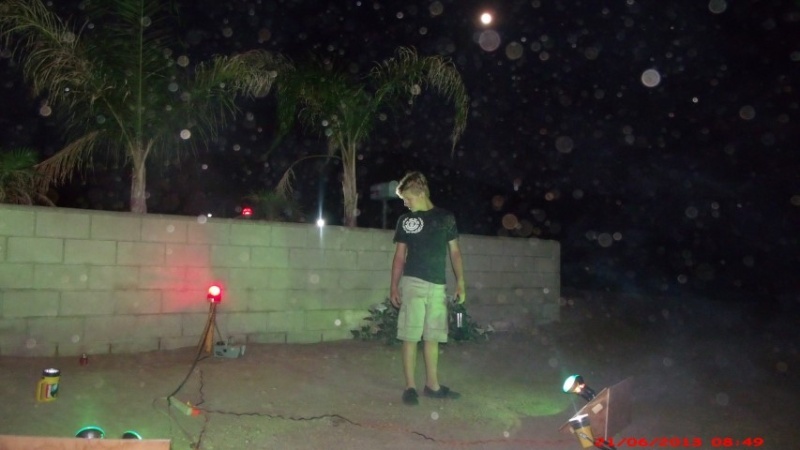 There were lights and a smoke machine and orbs love to sneak in on a full moon. 8 photos. There is a full moon in the background of a couple photos. They play hard rock and his instructor for music invited the Rolling Stones Magazine's photographer to come and check them out. The man taking photos had a Nikon movie and digital camera and was taking many photos of him and close ups of him playing. My grandson plays many instruments; sax, trombone, base trombone, drums, learning now: keyboard and singing lessons. His dream is to be the music instructor at a local university. He is in marching band, Jazz band and now his own band of 5 musicians. Shoot, the size was lowered but the 'attach file' says it is still too large. I'll try posting after I send this. Those were the best photos. Others don't have as many in it. As soon as my daughter returns the cables to my other external hard drive I'll post a photo of the band. Yes, orbs are spirits. Let me find an explanation from professionals. side tracked........I've just learned how to take my camera movies and make them viewable to others in a WMV format!1 https://youtu.be/w6_Hj3twfkw very helpful. the youtube movie about orbs is good, just watching it. Sorry to change to subject,Deb but just reading your profile on forums. I suddenly realised what a sad life you have had. Far worse than I have had,in fact I would say my life has pretty good. Just wanted to say that I sincerely hope you receive all the happiness you wish in your world. Thanks (((Joan))) very kind of you. But I have actually had an amazing life. I had a great childhood growing up. Traveled, an only child but not too spoiled. Great neighborhood growing up. Had great friends. Unfortunately I've lost them in life somewhere from here to Texas. I treat all my losses as lessons in life that I am grateful for. Where would I be spiritually if I had not lost what I have lost. Being abandoned by birth parents, parents, son, husband, jobs, friends, etc.etc. I thank everyone of my soul partners for giving me a great lesson of compassion, understanding, forgiveness and love. I'm just trying to get over a hurtle in life called "too much to do in life". Seems I've been carrying this through past lives. I have way too much to do at work and it keeps piling on. I get paid one day one week and the next is here before I know it. I've now been blessed with an amazing grandson who is on his way to stardom. And his new sister who is going to be just amazing. She smiled at me the other day. She's only six weeks old; starting to hold her head up. Really good baby, only screams when she's wet, hungry or messed her pants. What more can you ask for. I have a wonderful daughter who's the BEST mother in the world. Very supportive, loves her children and is darn right beautiful. I have a great life. Quite time to myself to write my heart out; busy if I want it to be. Time on weekends to do whatever I want. I have beautiful sunrises. I love to go out when not working and there are clouds in the sky and take photos of the spirits in the sky all facing the sunrise. I may not be wealthy but I have a lot of spiritual wisdom that fills me with abundance. I live in the country where it serene; not clouded by city life. One a medium said Abandonment was a huge lesson in my life. Abandonment lessons have been one of my big lessons of life. Abandonment lesson from: losing some grandparents prior or early in life. Abandonment lesson from: my parents dying early in my life. Abandonment lesson from: losing a job I had for 13 years; due to the decisions of my husband's relatives who are part of council and the decision. I just goggled "lessons of life, abandonment"
to pass onto other abandoned souls…. Lesson 2 – Acknowledge your experiences – take time to reflect on the events from your life and more importantly what you have learned from those experiences. Lesson 3 – Appreciate the people and things around you. Thank them and show them you are grateful. The more love you give, the more you’ll receive! Lesson 4 – Invest in yourself - and by invest I don’t mean with money, I mean believe in yourself, your goals and what you can achieve! Lesson 5 – Manifest your life - picture what you want, visualize, vision boards, talk about it, ask for it and watch as miracles happen. Lesson 6 – Be open to receiving and grateful for miracles in your life. Lesson 7 – Give - whether it is your time, your advice, your energy, make an effort to help others. The ironic thing about sharing is the more you give the more you get. Lesson 8 – Understand that the universe, God, angels whatever you prefer to call it has your back! There is a grand order to things and everything will unfold as it is meant to. If its not good, you’re not at the end yet. Exciting ha! Lesson 9 – Recognize others who are following in your footsteps and help them in their journey. We live our experiences so we can teach from them. Lesson 10 – Inspire! Inspire yourself and others! Share inspiring stories, messages, quotes, videos that will help other abandoned souls. My dear Debs.....you have had some bad times but you have come through those times waving the banner! You have a beautiful family and and new baby grandaughter. I was wondering how you were. You've come through life with a bit of a battle. In fact I would say a war. You've come through that war unscathed,a few bruises but with head held high! Keep the flag flying! Well Deb.You do indeed inspire others. I am just trying to be a team earth player. I feel beat up today though. Just woke from 9 hrs sleep. And I was in a meeting in my dream and falling asleep on the table head down. If I can find the photo I send Lindaru yesterday 11-27-12 was the date I want to show you all this photo...there are lights in the sky. I never noticed it before. I sent it to her (the alien expert;) ) and she said yes it was. I would like to find my original post to put it in - with the dream of ship at the back of my house with the alien ship. I've been searching for more. I think I found more. I've probably looked through 3,000 photos or more today. I will post what I have. Maybe I'll put side by side to show where I see it. some are small. I'm making sure they are not light reflections. There's a galactic website out there that has many groups and some post "alien" pictures that are only light reflections" One can tell the difference. In the meantime: here is a really good NDE video. Glad you liked it also Stephen. You want more on orbs Joan? Or is it near death experiences you want to watch more of. ATouchofHeart wrote: Or is it near death experiences you want to watch more of. Have you heard of Eben Alexander, MD who's is a neurosurgeon and had a NDE? After being struck by lightning and having a near-death experience, Dr Tony Cicoria began receiving what he terms "downloads" in the form of music composition for the piano. Dr Cicorias incredible journey has proved to him that there is more to life than what we see. I can't understand why some folks do not believe in NDE's. Or Lucid dreams etc,etc. I am on a site which really is more skeptic than believing in a life after death. it is supposed to be a site for Spiritualism and psychic affairs. I cannot understand why some mock the idea of a living another life when the physical life ends.